"Maximilien Luce, Neo-Impressionist. A Retrospective"
Born in 1858, Maximilien Luce discovered the divisionism of Seurat and Signac at the exhibition of the Independants in 1886. The next year, he exhibited in turn at the Salon a pointillist work, la Toilette, that was purchased by Signac. It was the start of a long friendship, that Luce expressed through portraits of the members of the neo-impressionist school, Seurat, Signac, Cross, Pissarro, or the art critic Fénéon. Luce's fiery temper led him to join the anarchists, for whom he drew many bills and press caricatures. His political opinions were probably responsible for not being granted his true place in art history during his lifetime. His works show a great command of technics and a high sense for colors, especially during his pointillist period. Luce favoured sunset lights, or landscapes bathing in a bright sunshine. He got enthusiastic about the works of Haussmann, that turned Paris into a huge work in progress. But human beings were always his main concern. During a trip to Belgium, Luce discovered the Borinage. Luce became the defender of the Black Land, and he depicted its coal tips and smelting furnaces with lyrism and without any miserabilism. The crimes committed during the Commune de Paris in 1871, that he wittnessed as a teenager, inspired him thirty years later huge canvases exposing the horrors of this civil war. Luce also stood by the soldiers of World War One, observing their resigned despondency in parisian train stations, during their leaves. 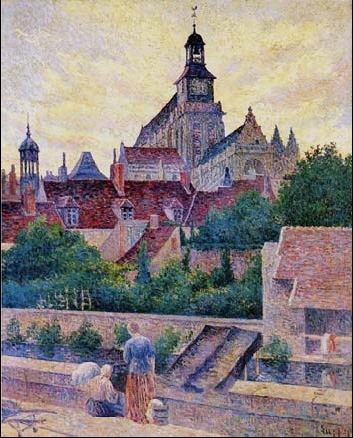 At the end of his life, Maximilien Luce found appeasement by settling down at Rolleboise on the Seine side, not far from Giverny, where he painted more detached and bucolic scenes. He died in 1941 at Rolleboise. Covering Luce’s career, the exhibition brings together around 60 works and features some of the most significant examples of Neo-impressionist painting.